Google Drive—formerly Google Docs—has come quite a way in nearly a decade of existence. Originally launched as Writely, a startup’s clever collaborative word processor, Google quickly acquired the app, changed the name to Google Docs, and released it as a new way to help people work together more efficiently using little more than a browser. Google changed the name again to Google Drive in April 2012, reflecting the ever-expanding goals and capabilities of the suite. Google Drive’s many and varied capabilities—from chat with collaborators in a document to the ability to automate your entire Drive—can sometime be surprising. I rounded up a few tips to help you get even more out of this online productivity platform. One of Google Drive’s best features is its ability to let you collaborate with other people on a document in real time. With so many comments going back and forth, however, it can sometimes be a challenge to find the right one. Recently Google added the ability to search not just your documents, but by the name of people who share documents with you. This is perfect if you can’t remember a document’s name, but you do remember who shared it. To use this feature, navigate to your drive in a Web browser, click the Shared with Me link to the left, and then enter a person’s name in the search field. All documents owned by them (or shared with the two of you) will appear. When you can’t remember a document’s name, but youdo remember who shared it, search by the person’s name. If you use Google Drive, it’s probably a safe bet you also use Gmail. If you want to save time and use Gmail’s search box to search both places, navigate to Gmail, click the Gear icon, and then choose Settings from the menu. Click the Labs tab and enable the Apps Search option. Now when you use Gmail’s search box, any relevant Google Drive documents will appear beneath Gmail results. The Google Drive for Mac service is a lot like Dropbox. It creates a folder on your Mac that syncs with your Google storage space so you can access the files from elsewhere. You can think of this feature as “Google does Dropbox.” The free Google Drive for Mac service creates a folder on your Mac that syncs all your files with your Google storage space, even files you can’t edit with Google Drive apps. Considering Google gives everyone 15GB of free space and offers generous paid upgrades if you need more, it’s a great first step into the Google-powered cloud. If you use Google Chrome ( ), the Save to Drive Chrome extension will make it easier to right-click and save just about anything you find straight to Drive. Having a conversation about the details of a document in email, then switching over to that document to make changes isn’t cool. Know what’s cool? Collaborating on a document in real time and having that conversation right there in the document. When you see one or more collaborators appear at the top of the document, click the chat button that appears to start a conversation to the right of what you’re working on. Plus, that conversation stays with the document as you work on it, share it with new collaborators, and move it around in your Drive. Know what’s cool? Collaborating on a document in real time and having a conversation right there in the document. Share a document on Drive by clicking the Share button. You can also share the link that appears through your social networks if you choose. Naturally, Google built some handy Google Drive tools into Google+, its social network. You can click the Sharebutton in the upper right to share a document with your Circles and get feedback, and you can show them off to your viewers while in a Google Hangout. Want to whip up some holiday gifts? Use your Drive documents and photos atCafepress to create mugs and T-shirts. The Spreadshirt Designer for Google Drive in the Chrome Web Store is also full of possibilities. You can fax documents directly from Google Drive with HelloFax, or use Wappwolf Automator for Google Drive to sync your drive with Dropbox, Evernote, Kindle, and Picasa, among others. What list of tips for a productivity suite as large as Google Drive would be complete without a mention of keyboard shortcuts? So here’s a list of keyboard shortcuts to help you work faster in Google Drive. Use the Research pane to view source documents while you work on your own. When you’re working in a document, it’s a pain to open a new tab or webpage to see source documents. Instead, try the Tools > Research menu option to open a research pane right inside a document. Not only is this convenient, but the pane presents tools that let you easily cite and source content, and you can drag-and-drop images straight over into your document. In June 2013, Google added official support for 18 new languages, bringing the grand total up to 65. Click the gear and go to Settings > General and pick your preferred language or one you’d like to practice. Google Drive’s Forms let you build surveys and collect data for just about anything you can imagine. You can turn a spreadsheet into a form or use the new Create > Formoption in your Drive. To make these forms even more useful, Google recently added some customization options that allow for things like progress bars, data validation, and embedding YouTube videos. To make forms even more useful, Google recently added some customization options that allow for things like progress bars, data validation, and embedding YouTube videos. If you need a way to navigate large documents or simply add a table of contents, theInsert > Table of contents menu item has you covered. Apply headings to content from the Format > Paragraph styles menu to build your table. Slides is Google Drive’s unsung gem, allowing you to create presentations á la Keynote and PowerPoint. Google recently added the ability to edit a theme’s master slides, simply by going to the Slide > Edit master menu item once you’ve picked a theme. If you want to work on documents with people who do not yet use Google Drive, Google recently acquired (and subsequently made free) the popular Quickoffice for iOS and Android. Quickoffice can read and edit Microsoft Office files but, if the opportunity arises, also transition documents into your Google Drive account. 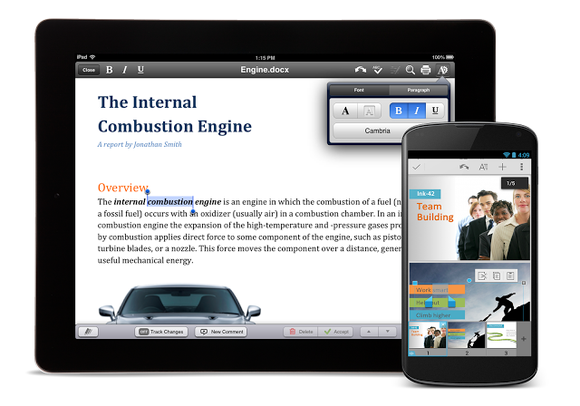 Google recently acquired the popular Quickoffice for iOS and Android. It lets you read and edit Microsoft Office files, or change them into Google Drive documents. 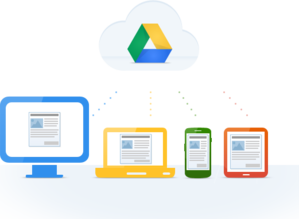 Want to access your Google Drive documents even when you’re offline? These instructions will let you install an app from the Chrome Web Store to take Google Drive offline should the need arise. As of this writing, you can work offline in your browser to edit documents, presentations, and drawings, but only view spreadsheets and presentations. How’s that for a Google Drive tips roundup? Did we miss your favorite? Let us know in the comments section.